A discussion that began earlier this year, after a shooter entered the halls of a Florida school and killed 17 students and staff members, evolved into possible action Wednesday night. The Maricopa Unified School District Governing Board and the Maricopa Police Department discussed installing video cameras on school campuses. Those cameras would stream live feeds 24/7 directly to MPD’s dispatch center. The proposal is contingent on a $300,000 Community Oriented Policing Services (COPS) grant applied for in July by the police department. Sequoia Pathway Academy is also reportedly partnering with MPD and MUSD in the quest for that money from the Department of Justice. “Everything on that video feed is evidence – it belongs to the police department and is stored with MPD once it becomes an investigation,” Stahl said. Fearing a “police-state” operation inside schools, MUSD board members expressed some hesitancy on the camera topic. Stahl explained MPD does not have the resources to monitor the feeds. Live recordings would only be accessed when the dispatch center was alerted to an emergency. Recordings would be stored in the cloud and deleted after 48 hours. Local schools would not be alone in turning to surveillance video for safety solutions, Stahl said. Marjory Stoneman Douglas High School in Florida installed additional security cameras on campus after the mass shooting. In March, MPD and local schools hosted a school-safety forum to answer community questions. Beefing up campus safety has been discussed in meetings that have dotted the agendas of Stahl and MUSD Superintendent Tracey Lopeman throughout the summer. Those brainstorm sessions produced other ideas on how to spend the grant money in addition to the cameras. The development of a cell phone app would give students the option of anonymously texting the police department in the case of suspicious activity. Grant money would also likely fund the installation of classroom door locks, according to Lopeman and Stahl. But digital and mechanical measures weren’t the only solutions discussed. School and police leaders will add manpower to school safety measures. Law enforcement muscle is commonly sought by districts through Student Resource Officers who provide education and protection on campus. 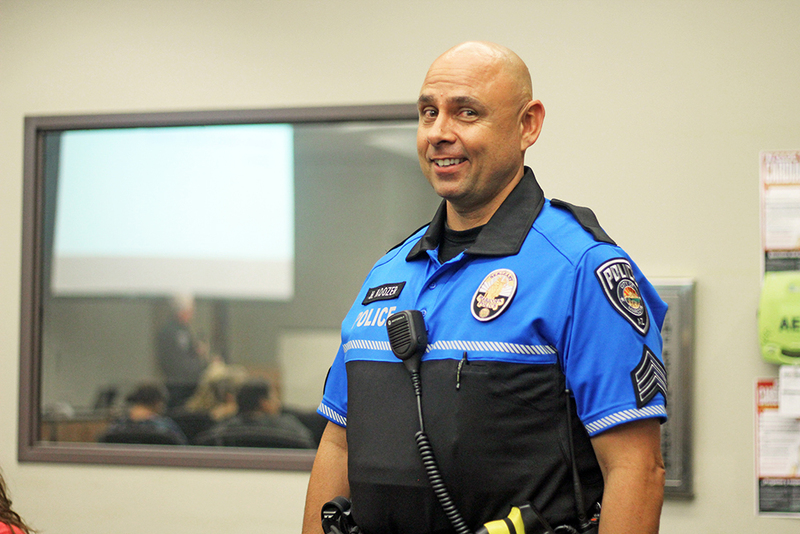 With city and school funding tight, there is only one SRO at MUSD – and the COPS grant does not support staffing. Five officers, led by MPD Sgt. Hal Koozer, will soon cycle through neighborhoods that house schools nearby. Stahl said the team will provide a quick response to campus emergencies. The team will also visit children at bus stops and make surprise appearances at lunchtime to encourage trust between students and officers. Their presence around town will increase once Maricopa feels relief from summer temperatures, Stahl said. The schools should learn whether their effort to receive grant money was successful sometime in October, Stahl said. If MUSD is awarded the money, Lopeman said students, parents and staff will have a say within the Safety Committee, which is planned to convene in the next 90 days.